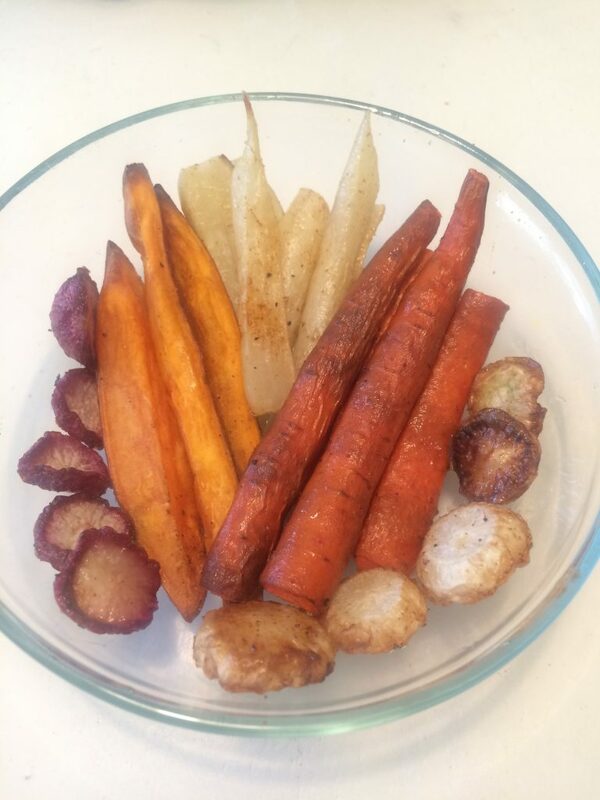 With the cool weather approaching, roasting vegetables is a great way to warm up. I love to make an assortment of veggies and mix them together for an easy side dish or snack. 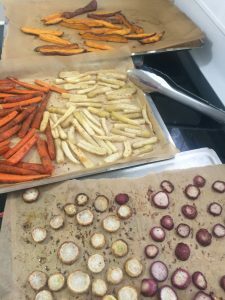 The roasting process brings out the natural fats and sugars in the veggies and root vegetables are ideal for this method. Try radishes, turnips, sweet potatoes, parsnips, carrots, beets, onions or any of your favorites. I usually don’t peel my organic veggies to give an extra portion of fiber. I wash and scrub the dirt and sand off and cut them into like sizes to ensure even cooking. For best results, separate like vegetables during cooking since some cook faster than others. I am not a fan of heating olive oil since its medium chain fatty acid structure is not stable under heat, so melted ghee is my choice of fat. Toss the cut veggies in a little ghee and spread them out in a single layer on a parchment paper lined baking sheet. Sprinkle with a little seasoning and pop them into a preheated 400 degree oven. In about 20 minutes flip the veggies over and rotate the pan. Check in another 10 minutes to see if they are done to your liking and every 10 minutes after until they are as golden as you like. Let them cool completely before packaging up any extras. Below is the spice mix I used with my latest batch of radishes, turnips, carrots, sweet potatoes and parsnips.